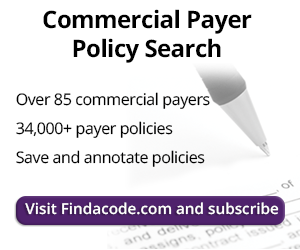 Are you Ready for CMS' 2019 Medicare Physician Fee Schedule Final Rule? Auditing Therapy Evaluation Codes - Not So Quick! Q/A: Why is Code 99080 Being Denied when Billed with an E/M Service? In order to understand and answer the question, "Why code 99080 is being denied when billed with an E/M Service, it is important to first review the requriements of selecting the appropriate level of Evaluation and Management service and how that relates to reporting a 99080 special report service. Continue reading for better understanding. Question: I have a provider that provides Department of Transportation (DOT) exams. I have found ICD-10 code Z02.4 (encounter for examination for drivers license) but I am unsure which CPT Code to use. Would I still use 99203 or 99204? Question Are there consultation codes that can be used for new and existing patients when a review of systems and detailed history is performed but no examination due to the patient's reluctance to make a decision to continue with the visit but has taken up 30-45 minutes of the doctors time? This week we had a great question posted to our online forum, and I thought it would be a nice thought- provoking question for our auditing and compliance tip of the week. What's the definition of an Office Visit and Can I Bill it With a Chiropractic Treatment? What is the definition of Office Visit? Can It be billed with a Chiropractic Treatment? What about using code 99123 E&M code for office visits? Can we bill of office visits even though we are giving chiropractic care? Should ROM Testing be Reported with Evaluation and Management Services? Reporting the performance of range of motion testing (95851-95852) at the same encounter of an Evaluation and Management (EM) service, produces an NCCI edit resulting in payment for the EM service and denial of the ROM testing. Read the article to learn what other codes ROM testing is considered incidental to. When coding an E/M visit in the emergency department, would you count all PFSH listed even if they don't pertain to the indication as to why the patient arrived? In January of 2010, CMS ceased payment of CPT codes for consultations (99241 through 99245 for outpatient, and 99251 through 99255 for inpatient). Consultation or Transfer of Care, What are the Differences? Evaluation and Management (E/M) codes are defined by the AMA Current Procedural Terminology (CPT®) codebook and while they are the most commonly utilized CPT codes, their code descriptions have not changed in years. I had a wheezer in the office, can I bil a 99215? What counts as social history? Can we bill a low level E/M with every procedure? I have attached a word document that you can print that explains the use of the new codes. Can a physician practice open an office in a nursing home? Who can document the HPI? Can we bill a nurse visit to Medicare in an RHC? Is time the trump card in selecting an E/M service? Is medical decision making a trump card in E/M services? Second opinions: are they consults? Can consults be billed based on time? Can prolonged services be added to preventive medicine codes? Can a Physicians Assistant do a consult? Do you need three vital signs for it to count? Some CPT® codes require an interval history. This article defines an interval history. Are two E/M services payable on the same day? There are times when physicians or NPPs see a patient twice in a single day, and want to know if both are reportable, and if both are paid by insurances or Medicare. In general, only one service is paid, but there are some instances in which both can be paid.